Asteroids, though neglected scientifically and publicly for a long time, have been the subject of much interest and debate over the past couple of decades. The discovery of 'impact rings' at the Yucatan peninsula (lending credit to the theory that an asteroid killed the dinosaurs 65 million years ago), the Shoemaker-Levy 9 incident of the mid-1990s, and movies such as 'Deep Impact' and 'Armageddon', have increased our awareness of this floating, dangerous, rocky debris. Former NASA Administrator Daniel Goldin's "faster, better, cheaper" motto has also been a boon to asteroid science mainly because a small asteroid relatively close to Earth - such as Cruithne - is a lot cheaper to visit than our neighboring friends, the planets. Altogether, the asteroids contain less than one thousandth the amount of material in the Earth. Ceres, for comparison, discovered in 1801 and still the largest asteroid, has a 605-mile diameter. The main asteroid belt in our solar system lies between Mars and Jupiter, but some asteroids cross Earth's orbit and even collide with Earth. S class asteroids of the inner belt, closer to Mars, consist mostly of stone and iron. C class asteroids of the outer belt are darker and more carbonaceous, similar in composition to the D class 'Trojan' asteroids in Jupiter's orbit. Asteroids in the V class are made of igneous material and the Centaurs, a quite literally far-out group of asteroids, follow paths between the orbits of Jupiter and Uranus. Historically, asteroids have given us clues as to how our solar system was formed. According to a popular theory, the four inner planets were formed when asteroids of different sizes all clumped together and over time became round, forming Mercury, Venus, Earth and Mars. Beyond that, many astronomers hypothesize that all or most of the asteroids making up the contents of the asteroid belt were actually all a part of a planet - probably rocky - that was ripped apart due to the gravitational effects of Jupiter (yes, it's that strong!). In our day-to-day world, asteroids inspire both awe and fear. The largest of the V class asteroids (it is made of basaltic rock) and also one of the first discovered. This asteroid was visited by the Galileo probe. This asteroid is notable for having a satellite, Dactyl, that is only 1.4km in diameter. It is not known how Dacyl was formed and how it became a satellite to Ida. This is the largest asteroid yet visited and also one of the slowest rotators. Its low density can only be explained by its porous composition. Due to Earth's gravity it's orbit is chaotic. It also wobbles along different axes that combine and create nonperiodic rotation. On September 29 2004 it came within four lunar distances, close enough to see with binoculars. 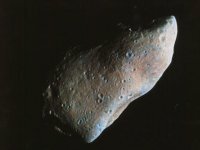 Castalia was the first ever asteroid to be imaged. This occurred in 1989 when it passed within eleven lunar distances of Earth and was imaged by radar from the Arecibo observatory in Puerto Rico. Launched on February 17, 1996, this probe (Catalogue No. 433), renamed for Eugene Shoemaker, arrived at Eros on the 14th of that same month in 2000. During its yearlong orbit around Eros, NEAR's cameras mapped the asteroid to a few metres resolution, its spectrometers analyzed Eros' composition, and its magnetometers searched for Eros' own magnetic field and its reactions with the solar magnetic field. The data gathered during this time was tenfold the original expectation. A year later, though NEAR was never created with the intention of an attempted landing, mission planners took advantage of the lack of fuel by carefully landing NEAR on Eros with a landing speed of four miles per hour, almost two metres per second, on February 12, 2001. During its descent onto the asteroid, NEAR captured 69 images and was shut down sixteen days later. Although not primarily an asteroid probe, Galileo was the first spacecraft to visit an asteroid - Gaspra - in 1991 on its way to Jupiter. It passed within 1000 miles of the asteroid and also revealed that another asteroid - Ida - has its own moon called Dactyl. Galileo was also the probe that witnessed the Shoemaker-Levy 9 incident of July 1994. This orbiter, launched May 9, 2003, studied the asteroid Itokawa, landed and collected surface samples, and then returned them to Earth in June 2010. The spacecraft also had a detachable minilander known as Minerva that failed to reach the surface. This asteroid probe scheduled to fly to and release a probe to impact comet 9P/Tempel 1, was launched January 12, 2005. It served as many American sky watchers' special July 4 firework that year when it released an 800 pound impactor onto Tempel 1 at 22800 mph that took images during its approach. The next day, Deep Impact itself flew past Tempel 1 and then extended its mission to flyby Comet Hartley 2 in 2010.